Basic Living - Blog: The Best Outdoor Cooking Set! Camping is a great way to spend quality time with your family and friends. However, because of all the preparation involved, some may choose not to deal with the trouble of acquiring a tent, sleeping bags, and everything else that makes a camping experience so fun and unique. If you are one of those people, here is a set for you! Kitchen to Go kit contains everything you need for you and your family have a good meal out in the wild. It includes a compact gas stove with spare gas cans, frying pan, a small pot, lighter, cooking utensils, a Wind N' Go flashlight, and a Wind N' Go Mini Lantern. Have you ever been unable to cook in your house because the power went out and your electric stoves won't work? I have been in those situations many times. Fortunately, the power outages occurred late at night, so there was no need for us to cook at the time, but in our home we now have portable gas stoves so that we do not find ourselves unable to cook a hot meal for our kids just because the power went out. Emergency survival is more than just making it through disasters, but it is "how" you survive them. If you are prepared, there will be no worries. 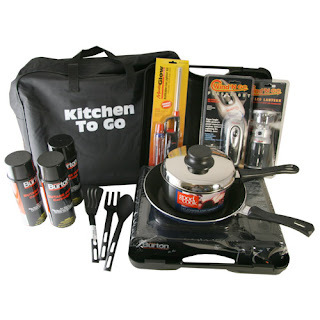 If you have electric stoves, the Kitchen to Go Kit is a kit for you!!! Check it out at survivalsuperstore.com today! I have seen your Blog... It’s too informative. An additional note for anyone reading this review - i discussed on top of that i am less gaga with the skillets these days than i used to be originally. this can be a lot of thanks to finding a good twelve in. non stick frying pan that serves our functions far better. They quality of the first skillets ar a similar (and affirmative, they are still the 'dogs' of the set) however by comparison, i do not realize them as helpful as they might be. It looks really nice! It goes very well with your stove too. That one set has a lot of cookings set and possibilities.